I’ve been loving oatmeal lately and there are so many healthy ways to enjoy it without getting bored! I’m sharing 15 healthy oatmeal recipes to spice up your meal plan and start the day right. One of the biggest adjustments to my FASTer Way to Fat Loss journey was not having breakfast first thing in the morning. I have always been a breakfast person and I didn’t know if I was capable of waiting until 11am to eat each day (on this plan we fast for 16 hours and eat during an 8 hour window) but I was willing to try. What I quickly realized was even if I don’t start eating til later in the day, I can still start my day with breakfast food. It was a win win! On my regular macro days, I love breaking my fast with a nice healthy oatmeal. It’s a great way to get some carbs in and feel like I’m still having breakfast, even if it’s for lunch! I love a classic bowl of oatmeal as much as the next gal but sometimes I need something a little more fun. 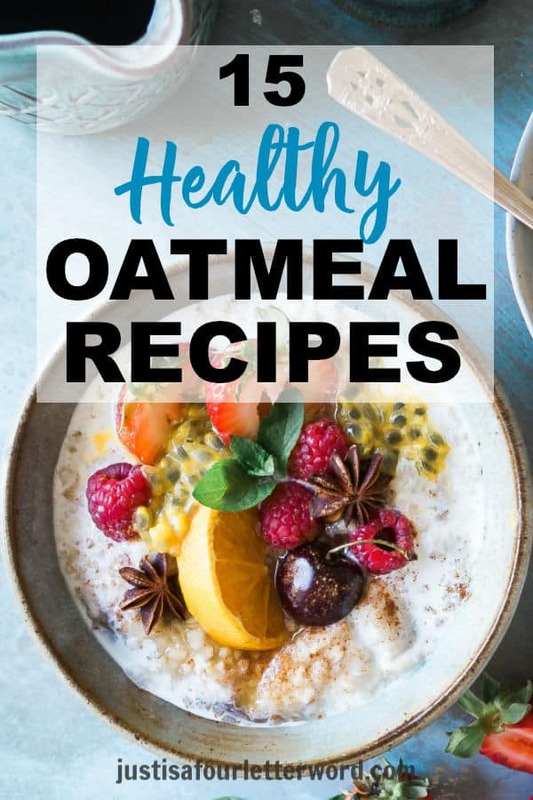 I’m loving these healthy oatmeal recipes because now that I’m on an eating plan that loves carbs, it feels like such a treat! Have you ever had a morning glory muffin? These Morning Glory Overnight Oats by Cook Nourish Bliss sound like the perfect substitute with much less sugar. Yum! If you are a coconut lover like me, check out the Coconut Cream Pie Chia Overnight Oats by Flavor The Moments and satisfy your sweet tooth with some healthy fats. Make some Apple Pie Overnight Oats by The Lemon Bowl in a large batch on Sunday and grab one on your way out the door! Just remember to pop them in the fridge at work if you plan to eat them later. I’m not judging if you want to eat this for breakfast, But this Slow Cooker Chocolate Cherry Steel Cut Oatmeal recipe by Running To The Kitchen could double as a decadent dessert! Oatmeal doesn’t just have to be for breakfast, y’all. This Blueberry Peach Oatmeal by Eating Bird Food has my little southern heart aflutter. This reminds me of the old cream of wheat days but sooo much better. Anyone else remember those little flavored packets? Want to try your hand at steel cut oats but not sure where to start? 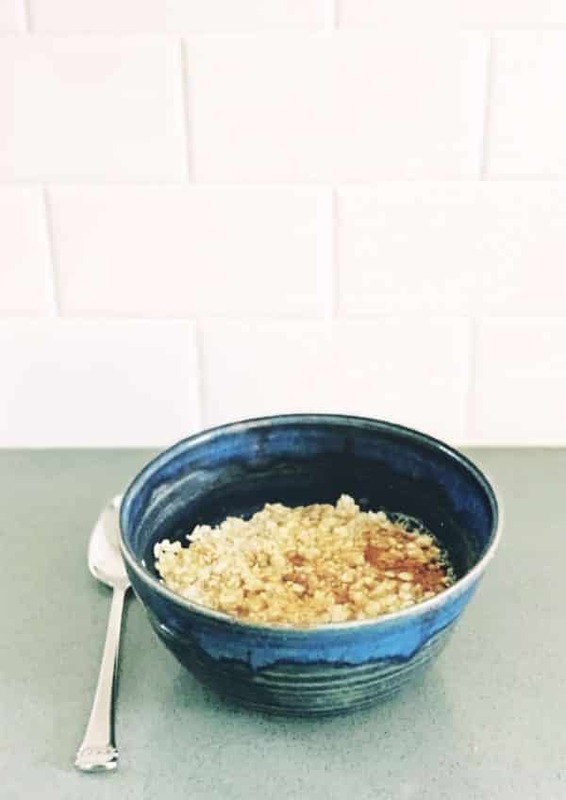 This Instant Pot Steel Cut Oats by Detoxinista is a great way to make a big batch and then flavor them however you like. What about including a Turmeric Oatmeal Glowing Breakfast Bowl in your rotation? This recipe by Lauren Caris Cooks adds a new spin on this healthy spice. LumberJack Oatmeal by Tastes Of Lizzy T is exactly what I think of first when I think oatmeal. It’s hearty and sweet and has nuts and raisins. It’s the perfect classic recipe. I’m totally intrigued by this Overnight Chilled Plum Oatmeal Pudding by Brown Eyed Baker! I don’t know why I haven’t thought to add plums to my oatmeal before but I’m sold on this recipe! I love that it’s dairy-free too. And speaking of out-of-the-boax thinking, I’m drooling over the Savory Baked Oatmeal With Bacon Mushrooms and Caramelized Onions recipe from Savory Simple. Sometimes sweet just doesn’t cut it for me. This sounds amazing! You can make this anytime of year, but I’m adding the Healthy Pumpkin Baked Oatmeal recipe by Well Plated to my list of fall goodies. I mean is anything more fall than pumpkins and pecans? OK maybe this Date Sweetened Apple Pie Oatmeal by Minimalist Baker says fall too but keep it year-round. I love that she uses dates for sweetness. Dates are so underrated! Here’s another recipe that would make a great muffin substitute. Try this Blueberry Baked Oatmeal by Crazy For Crust! Vegan Baked Oatmeal by Blissful Basil makes a great on-the-go option. Since it’s baked, this oatmeal can be cut into bars. So smart! Loving this Baked PB & J Oatmeal by Lexi’s Clean Kitchen for a little twist on a classic flavor. And I love that you can make a big batch to eat from all week. Less work, more food! On the days when you run out of ingredients or just didn’t have time to think ahead, simple oatmeal is just as good. I keep quick oats and maple syrup on hand and that’s what I have most days. It’s delicious! If I really want to get fancy, sometimes I even throw in a splash of coconut almond milk. I wanted to add this little trick because even when we love trying new recipes, some days we just need a quick fix. No judging here! Want to try something other than oatmeal? Check out my spicy black bean burger with egg recipe. It’s SO good! Want three more easy recipes to keep on hand? 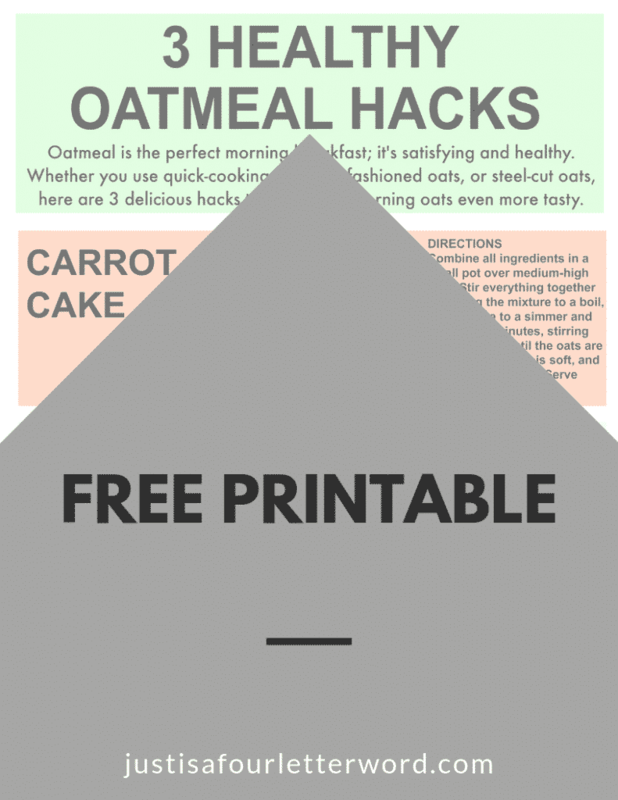 Sign up to get your free oatmeal hacks printable and make sure you don’t miss out on more recipes! Do you have any favorite healthy oatmeal recipes? Please share!